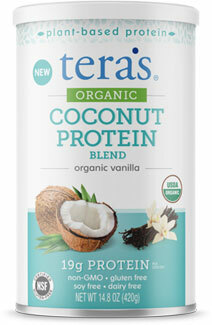 Boasting 19 grams of protein per serving, this complete plant based protein is a vegan dream come true! With plenty of healthy plant-based protein and 7 grams of healthy fiber per serving, it's certified organic, non-GMO, gluten-free, soy-free and dairy-free, making it the perfect choice for those looking for a natural vegan protein that's made only with pure, natural ingredients and nothing extra. Low in carbohydrates with a delicious vanilla flavor, it blends perfectly into water or your favorite shakes and smoothies for a delicious protein-packed blast that mixes up quickly and easily. 14.8 oz. (420g) container has 11 servings. $29.99 per container.